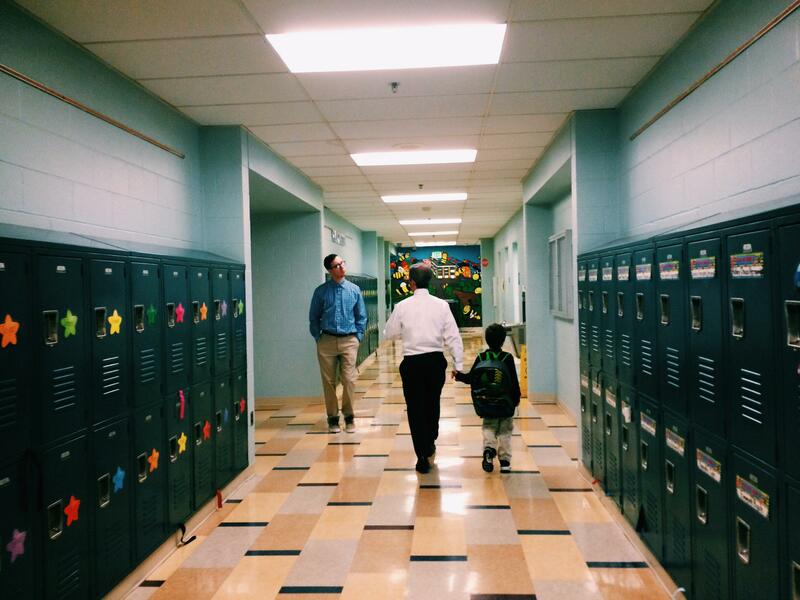 Principal Matt Hornbeck takes a student to his classroom. Still, Baltimore’s school system, like many urban systems throughout the nation, remains highly segregated. The vast majority of students—about 85 percent—are African American and that same proportion is poor enough to qualify for free or reduced price meals. The 700-plus page report on educational inequality was required by the Civil Rights Act of 1964. The report was researched in an age when former President Lyndon Johnson’s administration was pushing to eliminate poverty and racial injustice through broad social services. At the University of Michigan that same year, Johnson gave his famous Great Society Speech, outlining his agenda. "So we must give every child a place to sit and a teacher to learn from," he said. "Poverty must not be a bar to learning, and learning must offer an escape from poverty." The expectation was that the study would find that school resources were unequal, but what the report found, based on data from more than 600,000 first, third, sixth, ninth and 12th graders (as well as thousands of teachers) was that there were unequal schools by some measures, but what really explained the differences in academic achievement was family background and neighborhoods. Sociologist Kathryn Edin says the report, "provided a disturbing portrait of inequality, and it really took a hard look on what was underneath these differences." Edin studies poverty and was a presenter at a symposium on the Coleman Report held in early October at Johns Hopkins University. "It was an incredibly honest document,” she said. “It pointed to the primacy of family background. That remains true today and it also showed how important the multiple contexts in which kids were embedded mattered . . . so family structure, neighborhood, school all working together to shape the life chances of children." More recent studies echo Coleman’s findings - from stereotypes, to expenditures on school facilities, to the effects of parent involvement in schools - the poorest school districts, which usually are majority minority, remain behind the national average. In fact, the rich-poor achievement gap has grown even wider in the past few decades. It’s a point of frustration for Ted Davis, a political scientist at the University of Delaware. "We are 60 years beyond Brown, 50 years beyond the Civil Rights Act of 1964 and all of these reports: the Moynihan Report, the Coleman Report,” he said between sessions at the Coleman Report conference. “And we’re still dealing with this issue in terms of disparities in educational outcomes in particular in terms of academic achievement." In East Baltimore, there’s a school that shines as an exception. Hampstead Hill Academy is an elementary and middle school of close to 800 students next to Patterson Park. It’s a conversion charter – everyone who lives in the school’s zone has an automatic seat. "And it’s the same zone it’s been for decades,” explained Matt Hornbeck, the school’s principal. “And if we have any extra spaces they go to families who live outside of the zone by lottery. We are very full. We have a 200 student waiting list." That’s because students outperform city averages on tests across the board and the school is one of the most diverse in the city -- 40 % Hispanic, 40% white and 20% African American. There’s a vibrant atmosphere and opportunities for enrichment. Jacqueline Clary teaches first grade here. She taught previously at Furman Templeton Elementary in West Baltimore. With a 98% poverty rate and the same percentage of African American students, that school looks like the neighborhood. Clary says there was a "notion that those students can’t achieve very much" at Templeton. "So the teachers going in don’t make the effort to really raise the bar very high, so as a result they continue to fall farther and farther behind and the achievement gap grows." 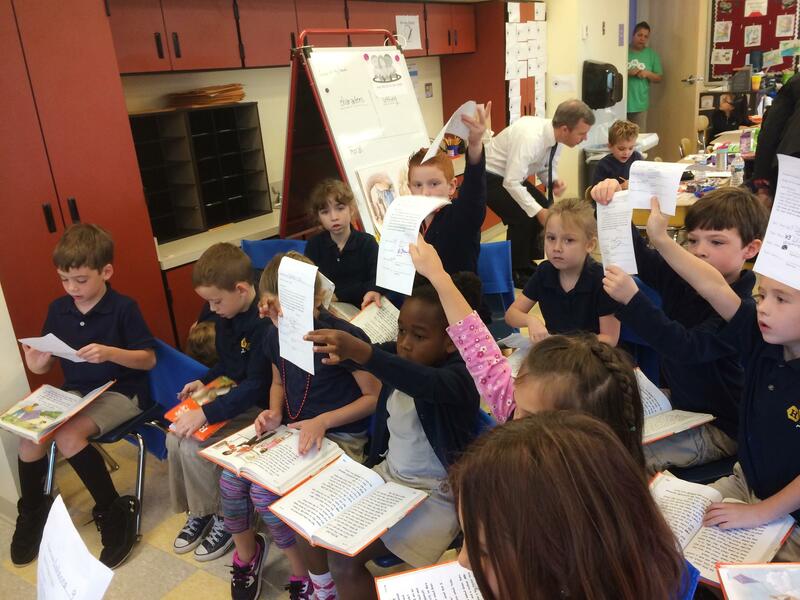 Jacqueline Clary's first graders display their homework before a group reading activity. She says she’s noticed that the diversity at Hampstead Hill fosters higher expectations for the students. And countless studies have shown that diversity helps all students. Karl Alexander, a former Hopkins professor, has written about the importance of integrating schools. He is trying to start a public school in the city through his organization, The Thurgood Marshall Alliance, that would be majority middle class. "It’s not that being middle class just rubs off on other kids, but middle class families can bring to bear resources that poor families can’t as advocates for their children," he explained. He says that as the school environment strengthens, there are positive ripple effects. "The enrollment is more stable and teaching staff is more stable. You can elevate the academic programming to a more challenging level. There are all these derivative benefits that typically follow from having a strong middle class presence." Cindy Pappas, who lives in Canton, is one of those middle class parents. She has two sons at Hampstead Hill—a fourth grader and a first grader. "We are at a place where we could have taken a private school path but each year there is no absolutely no reason for us leave," she said. "This is where we live and work, and we love this school." She says prestigious private schools north of the city offer buses for downtown families, trying to make it easier for them, but she wants her kids to have more diverse experiences than they would at a private school. And, she says, the quality of the education at Hampstead Hill is comparable. Edin, the sociologist, says poor families often don’t have the kinds of choices Pappas has. "The vast majority of their moves are forced or reactive," she said. "So the window of time they have to research a neighborhood and school choices is perilously slim." And this means that poor families are often simply avoiding the negative, rather than seeking out the positive. So if the most successful schools are the ones with economic and racial diversity, what can be done? Edin says if the city can keep middle class families who might otherwise move or send their kids to independent or parochial schools, there could be some major gains for all kids. "There’s a virtuous circle," she said. "You get the middle class parents starting with kindergarten, sending their kids to the local school, you begin to attract better teachers, parents with resources bring resources, you change the norms of parental engagement, parents begin demanding more [and] kids build friendships and understanding across race and class lines." She says that should be the model going forward. And Hampstead Hill Academy shows that having just 15 to 20 percent of families firmly in the middle class can foster a successful school, though even here, there are some disparities in achievement along race and class lines. However, there are large numbers of low income students at the school who perform just as well as their wealthier peers. Though the tools and questions are more refined, the concerns outlined in the Coleman Report reverberate today, and it’s a reminder that continuing to seek strategies to create stable and safe schools in diverse communities not only reflects the country’s social fabric, it’s essential for equal opportunity.